The revolution can begin anywhere, in Darmstadt for example. It mustn’t sound glossy. The revolution should rattle and simmer with a raw euphoria. 15 years after the band was formed, the name Woog Riots has become synonymous with imaginative and catchy pop songs. Their lo-fi sound and lyrics have a seditious yet deeply human quality. 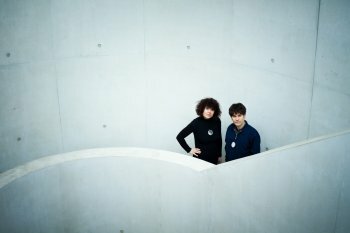 Silvana Battisti and Marc Herbert, the charismatic couple who mastermind the project, have shown that politics and the private, art and attitude, love and revolution as a life concept, can be combined with controversy and good humour. Their sixth album Cut-up and Paste is no less than a danceable call to arms, to critically question our crazy world, to acknowledge our diverse influences and to bravely rise up against exclusion. In People Reading Marx Woog Riots transfer social criticism to La-La-Land with a laconic swing - without pointing so much as a discofinger. The duo re-interprets the Beatles classic Revolution, transforming it into a cool underground anthem. To All You Racists is a charming protest song of the finest Woody Guthrie singalong tradition, with a cheery invitation to Nazis and their fellow travellers to go away. The Woog Riots’ musical and spiritual openness combine in No Borders. This grooving mantra was inpired by astronaut Alexander Gerst, who - when viewing Earth from the International Space Station - stated he could not, with the best effort, recognize any borders. The universe and the dancefloor know no bounds. With Cut-up and Paste the Woog Riot’s express their passion for art in all its diversity. The album title was inspired by a Basquiat exhibition in the Schirn, Frankfurt. Silvana and Marc identify strongly with the work of the New York artist, known for incorporating pieces of other peoples art into his own works: “We take existing snippets of musical heritage and interpret them completely differently. Similar to Hip Hop, except that we don’t sample but create everything new.” The results are electro-pop collages that do much more than charge the present with a cold beat. The charm of Woog Riots’ music lies in its imperfect beauty, in free-purring melodies, in playful minimalism, in garage glam sandwiched between bubblegum and Kraftwerk.